A former orchard where peaches, apples and pears were grown will soon be the home of a wetland habitat that will help filter run-off pollution from Talley Day Park in Brandywine Hundred. “Putting a little emphasis on a portion of Talley Day Park, which has always been an unusable act of recreational area and turning into an educational and environmental area,” said Jonathan Husband with New Castle County’s Special Services Department. The wetland habitat, adjacent to Shellpot Creek, is an ongoing project happening on the New Castle County-owned Streed Property, which is a former farmstead. These wetlands will help control stormwater runoff, reduce erosion, and feature native plants to support a wetland habitat. While reducing maintenance to the ground, the vegetated swales provide stormwater management, a habitat for wildlife, and a reduction in greenhouse gas emissions. "The swales are important because the natural vegetation form this area absorbs the pollution and nutrients before entering the water ways,” said Bernadette Igo with New Castle County’s Special Services Department. 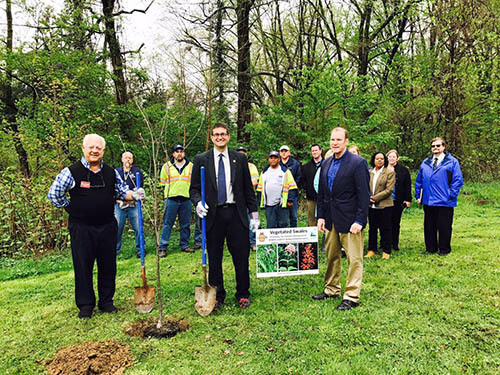 During their visit, Meyer and New Castle County's Council Member Bob Weiner to recognize Earth Day, which is Saturday, by planting a tree that's part of landscaping plans property. The swamp white oak is native to the region, thrives in wetlands and will provided habitat for wildlife. “Talley Day Park is a local treasure that is enjoyed by thousands of New Castle County residents each year,” said Weiner. The county’s focus is to create a sculpted wetland area with a boardwalk running through it for wetland education. The creation of the wetlands has was made possible through the county’s collaboration with the Partnership for the Delaware Estuary.